ChildChild age: 6-12 years. Under 6 ride free when not occupying a seat. WELCOME TO NEW ORLEANS, AMERICA'S MOST INTERESTING CITY! 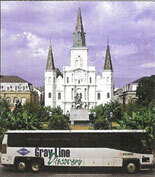 See the "Big Easy" in comfort in a deluxe motorcoach. On this narrated tour, learn Three centuries of New Orleans history, legends and romance. Tour all the "districts" and even stop at one of the Cities of the Dead. Absorb the sights & sounds of the world famous French Quarter and historic Jackson Square, home of the Cabildo and Presbytere Museums. Visit one of historic cemeteries, referred to as "Cities of the Dead," and learn about this unique above ground burial system. Marvel at stories of voodoo and piracy on Bayou St. John, the waterway used by Jean Lafitte and his band of pirates, as we make our way to the shores of Lake Pontchartrain. 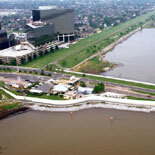 View the longest bridge over water in the world, the Lake Pontchartrain Causeway. Follow the path of the St. Charles Avenue streetcar, the oldest continuously operating passenger railway system in the world, past the homes of former Kings & Queens of Mardi Gras, stately mansions and the world-famous, exclusive Garden District. View Tulane and Loyola Universities across from Audubon Park, home to one of the top five zoos in the nation, The Audubon Zoo. Tours Begin at the "Lighthouse"
Daily at 9:00am, 12:00pm and 2:00pm. March 1-October 31 additional tour departure time at 3:00pm. Closed New Years Day, Mardi Gras, Thanksgiving Day and Christmas Day. Reservations are required. 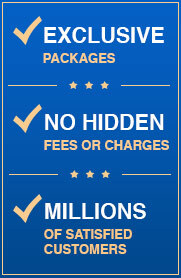 Ticket will contain details for reconfirming the reservation. 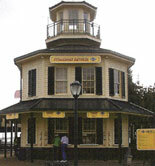 Gray Line Lighthouse Ticket Office located at Toulouse St. and the Mississippi River in the French Quarter. Toulouse St. and Decatur St.
Pay parking is available but walking to the Gray Line Ticket Office is encouraged to help ease traffic congestion in the French Quarter. Child's rate for 6-12 years of age. 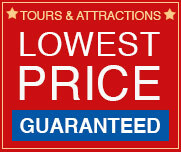 Children under 6 not occupying a seat travel free of charge for sightseeing tours.